This is a cute costume starter that works really well in cooler late October weather. 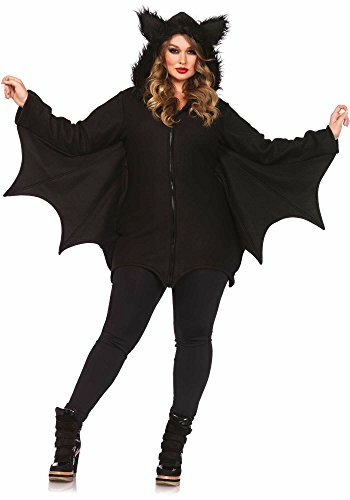 Dress up as a bat with this fun plus size bat costume! The main part of this bat costume is the front zip sweater with fun bat wings. The cozy fleece top is roomy and will layer well with other pieces. The costume comes with a furry bat hat as well. Add black leggings or tights and some black shoes for an easy and complete plus size Halloween costume. The 5th season of AMC's The Walking Dead will premiere on October 12th. Are you as excited as we are to see Rick Grimes and his gang of misfits take on more of the dead --... Will you be a walker or a zombie-hunter? See the costumes!